Politics & P2P: P2P Hurts UK Music Sales? ... or so we're told. 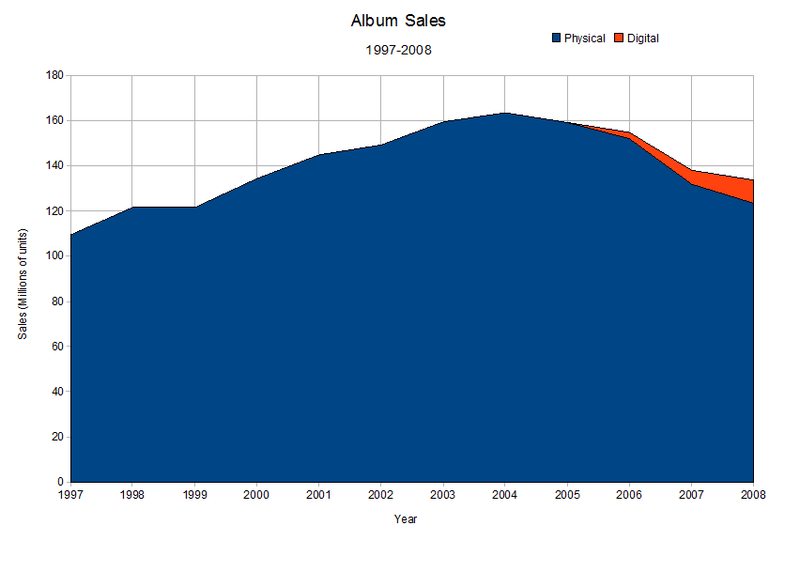 There is a belief, that music sales are being harmed by the internet. MP3's and peer-to-peer (p2p) networks have made swapping music easy, ever since Napster burst onto the scene in 1999. There is even a section on the BPI's website that deals with it (strangely titled "File-sharing FAQ's"
Aside from the fact that filesharing infringes and undermines the rights of the creators and investors in music, it’s enormously damaging to music sales. Well, according to figures from the UK music industry themselves, the answer is No. I have already published this info once, in my recent consultation response submitted to the UK government. What I didn't do, however, was show what those figures look like. After all an arcane group of numbers might look like anything, what's needed are some illustrations. Without further ado, let's get to the data then. The data is provided from two sources. 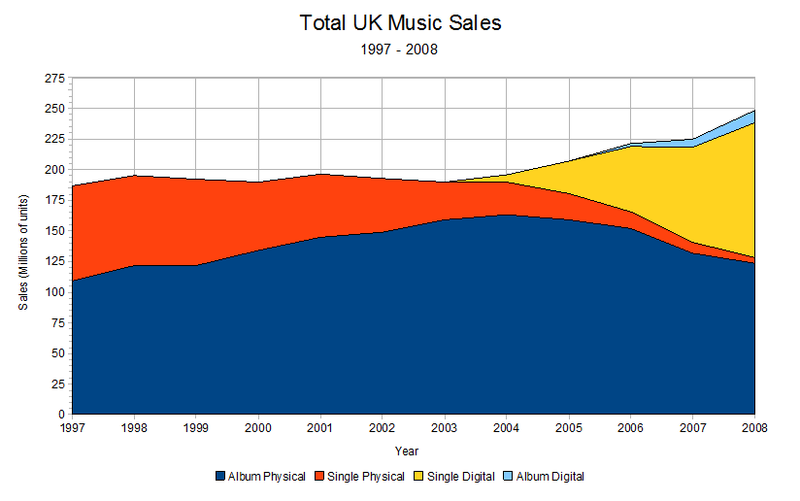 The data comes from the Official UK Charts company information pack, And the BPI “Top market lines” publication. 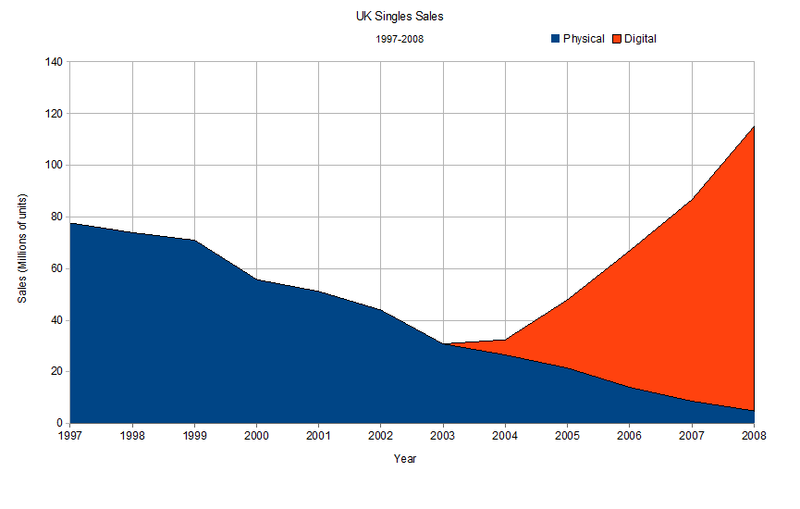 Also, as the BPI notes, digital album data was only collected from Q2 2006 onwards, so prior to that, any sales were unrecorded. This might look like boring data, so lets add the graphs. Doesn't look all that damaging to sales to me. One last test though, let's look at all those sales numbers combined, see just how much the sales have been 'hurt' over the last 10 years by P2P. Anyone want to point me to where the sales are damaged?